Puma SE at its Capital Markets Day revealed intentions to re-enter the performance basketball category. The company also said it expects currency-adjusted consolidated net sales to grow around 10 percent on average per year until 2022. The brand left the basketball category in 2001 and has hinted that it may return to endorsing a major American sport in recent years. The sports focus has recently been soccer, running and golf. The basketball focus is expected to particularly support growth in both the U.S. and China. According to slides prepared for the presentation to investors, Bjørn Gulden, CEO, listed “American Sports-Reenter Basketball” as the sixth of its midterm priorities. The first four priorities , Create Brand Heat, Fix The Product Engine, Improve Quality Of Distribution and Simplify Organization & Build Competitive Infrastructure, were formed in 2013 when it set its turnaround plan. In 2015, Build Comprehensive Offering For Women was added as the fifth priority. Puma has already signed Skylar Diggins-Smith of the Dallas Wings in the WNBA in July 2017. 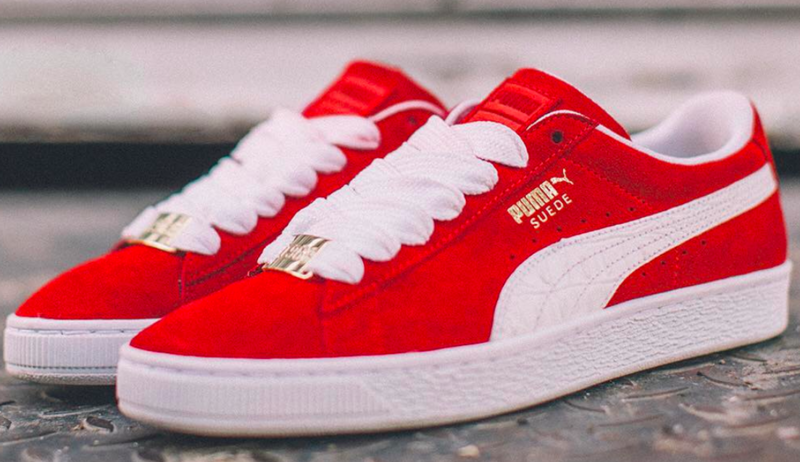 As far as its history, Puma in basketball is best known for the Puma Clyde, the suede model made for Walt “Clyde” Frazier in 1973, when he starred for the New York Knicks. Other former stars who have worn Puma include Isiah Thomas, Vince Carter and Cedric Ceballos. Gulden noted that the “American kid” is interested in four American sports: baseball, American football, golf and basketball. But he underscored the strong connection between basketball and urban culture. He noted that basketball styles continue to dominate footwear sales, showing a chart of the top U.S. best sellers for 2017 with five Jordan models, two each by Nike and Adidas and one from Converse. Gulden also noted that that a number of retro styles from the past are already helping Puma’s lifestyle offerings. These include the Slipstream (Snake OG), Avenue Hi, Basket Super (’85 catalogue), Sky Lo (’92 catalogue) and Sky Hi (’92 catalogue). Puma’s priorities for 2018 include accelerating growth in men’s, continuing momentum in women’s and igniting the global football (soccer) business. For 2018, Puma expects net sales to grow approximately 10 percent on a currency-neutral basis, gross margins to improve slightly and EBIT to improve to euro €305 to €325 million from €345 million in 2018. Sales to grow over the next five years at a 10 percent CAGR. Sales were €4.1 billion in 2017. Gross profit margin to expand to between 49 to 50 percent, up from 47.3 percent in 2017. Operating expense ratio to range to between 39 to 40 percent of sales, down from 41.3 percent in 2017. EBIT margin to improve to 10 percent of sales, up from 5.9 percent in 2017.